I have a new electric pencil sharpener and I am really impressed with it. 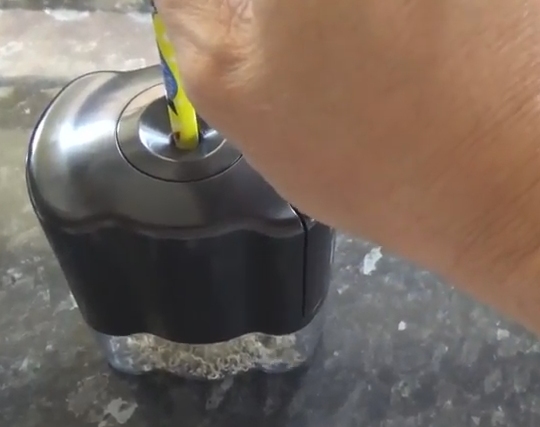 For those people into the art of adult coloring books, the automatic battery powered pencil sharpener is a real benefit and time saving gadget to get your hands on. It’s quite large – at least the size of my fist which you can see in the video and with its FOUR AA 1.5 volt batteries installed it has a weight to it which helps it stay in position whilst sharpening the pencils. Along with its weight, there are four rubber pads on the bottom which stop it from slipping as the motors turn to sharpen the pencils in an automatic way as you hold on to them. 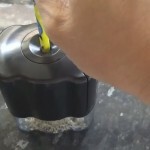 These are actually features of an electric pencil sharpener which shouldn’t be overlooked, because whilst they sound trivial, the box will actually try to rotate as the blades rotate around the tip of the pencil. Remember Isaac Newton – for every force there is an equal and opposite force. The gadget is ideal for all wooden pencils of any hardness, they are honed automatically to a pin sharp point within around 10 seconds no matter how blunt they were originally. Even a blank pencil will take on its first sharp point in next to no time. You have to hold on tight to it, because as I stated above, it will try and rotate away from the pencil as it sharpens, but placed on the right surface it is even possible to sharpen a pencil with only one hand, as you can see in the video. One nice feature is that it stops sharpening once the pencil is ready and the lead is as sharp as it will possibly get. Why is this an important feature of the battery powered pencil sharpener? Well let me tell you – because if they do not stop when done, you will inevitably waste large lengths of pencil by carrying on shaving the end because you cannot see it is ready. So all in all a perfect device. Not only this, but all the shavings are collected in a small bin beneath the blades, so there is no mess. Furthermore, when using a non-automatic, non powered pencil sharpener, you will often make your fingers dirty with the lead shavings – not the wood part – just the lead. This is because the lead itself will tend to powder as it turns and coat your fingers, the next problem is that this lead will smudge on your paper when you are drawing or coloring in unless you go ahead and wash your hands with every single pencil you sharpen. Take a look at the video. You can hear the blades as they grind away at the tip of the pencil to produce the perfect sharp point – ready to get those books colored in! How long the battery power will last largely depends on how often you use the sharpener – of course – but if you use rechargable batteries you will be able to spend many a happy hour bringing your favorite pencils back to life in a jiffy. Another stunning feature is one of safety – a micro switch at the hole entrance activates the motors, given that you cannot possibly insert your finger into the hole as it is too small, there is absolutely no danger of trapping your finger in the blades and shaving off your skin.